You are browsing the archive for Open Access Week. This post is part of our Open Access Week blog series to highlight great work in Open Access communities around the world. 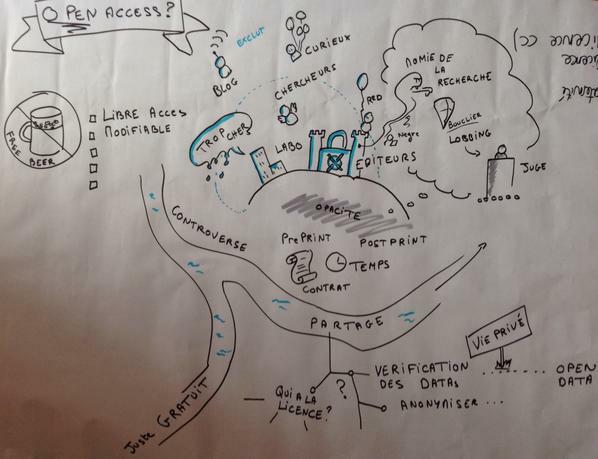 It is written by Celya Gruson-Daniel from Open Knowledge France and reports from “Open Access Xsprint”, a creative workshop held on October 20 in the biohackerspace La Paillasse in Paris – as announced here. More and more information is available online about Open Access. However it’s difficult to process all this content when one is a busy PhD Student or researcher. Moreover, people already informed and convinced are often the main spectators. 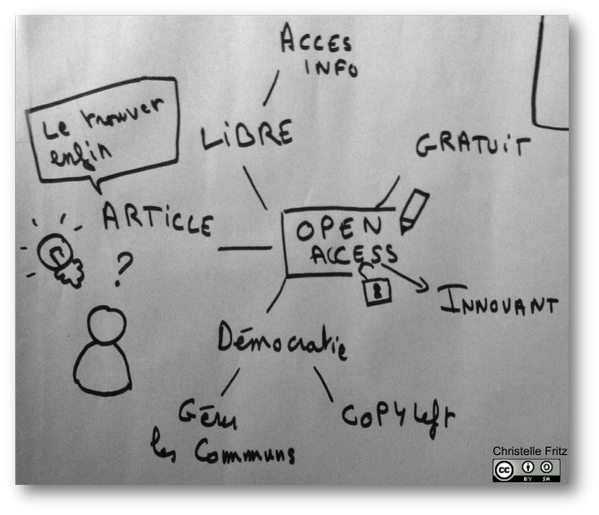 The question thus becomes : How to spread the world about Open Access to a large audience ? (researchers, students but also people who are not directly concerned). With the HackYourPhD community, we have been developing initiatives to invent new creative formats and to raise curiosity and/or interest about Open Access. 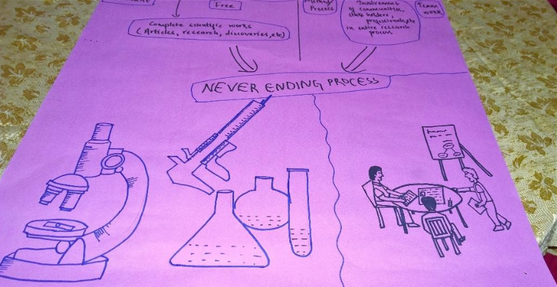 Open Access Week was a perfect occasion to propose workshops to experiment with those kinds of formats. The main objective was to produce appealing guidelines about the legal aspects and issues of Open Access through innovative formats such as livesketching, or comics. HackYourPhD has been working with Sharelex on this topic for several months. 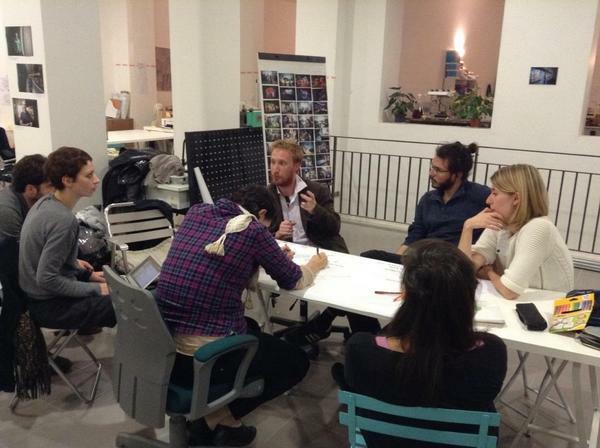 Sharelex aims at providing access to the law to everyone with the use of a collaborative workshop and forum. A first content has been produced in French and was used during the Open Access XSprint. These sessions brings together illustrators, graphic designers, students, researchers. After a short introduction to get to know each other, the group discussed about the meaning of Open Access and its definition. First Livesketching and illustration emerged. Comments Off on Nature-branded journal goes Open Access-only: Can we celebrate already? This post is part of our Open Access Week blog series to highlight great work in Open Access communities around the world. 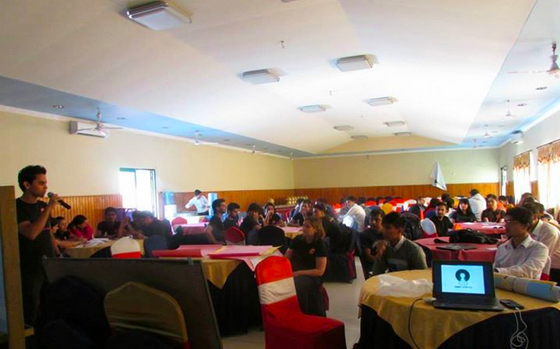 Open Access Week was celebrated for the first time in Nepal for the opening 2 days: October 20, 21. The event, which was led by newly founded Open Access Nepal, and supported by EIFL and R2RC, featured a series of workshops, presentation, and peer to peer discussions and training by country leaders in Open Access, Open Knowledge, and Open Data including a 3 hour workshop on Open Science and Collaborative Research by Open Knowledge Nepal on the second day. 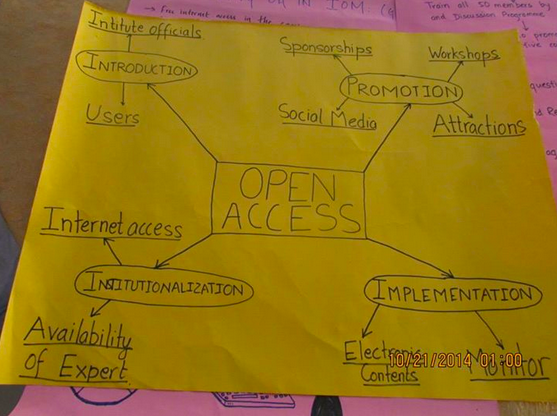 Open Access Nepal is a student led initiative that mostly includes students of MBBS. Most of the audience of Open Access Week celebrations here, hence, included med students, but engineering students, management students, librarians, professionals, and academics were also well represented. Participants discussed open access developments in Nepal and their roles in promoting and advancing open access. 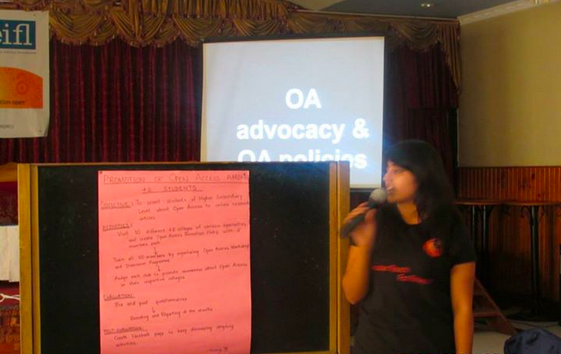 EIFL and Right to Research Coalition provided financial support for the Open Access Week in Nepal. EIFL Open Access Program Manager Iryna Kuchma attended the conference as speaker and facilitator of workshops. Open Knowledge Nepal hosted an interactive session on Open Science and Collaborative Research on the second day of two. The session we led by Kshitiz Khanal, Team Leader of Open Access / Open Science for Open Knowledge Nepal with support from Iryna Kuchma and Nikesh Balami, Team Leader of Open Government Data. About 8-10 Open Access experts of the country were present inside the hall to assist participants. The session began a half an hour before lunch where participants were first asked to brainstorm till lunch was over about what they think Open Science and Collaborative Research is, and the challenges relevant to Open Access that they have faced / might face in their Research endeavors. The participants were seated in round tables in groups of 7-8 persons, making a total of 5 groups. After lunch, one team member from each group took turns in the front to present the summary of their brain-storming in colored chart papers. Participants came up with near exact definitions and reflected the troubles researchers in the country have been facing regarding Open Access. As we can expect of industrious students, some groups impressed the session hosts and experts with interesting graphical illustrations. Iryna followed the presentations by her presentation where she introduced the concept, principles, and examples related to Open Science. Kshitiz followed Iryna with his presentation on Collaborative Research. Session on Collaborative Research featured industry – academia collaborations facilitated by government. Collaborative Research needs more attention in Nepal as World Bank’s data of Nepal shows that total R&D investment is only equivalent to 0.3% of total GDP. 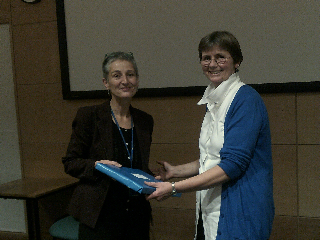 Lambert Toolkit, created by the Intellectual Property Office of the UK, was also discussed. The toolkit provides agreement samples for industry – university collaborations, multi–party consortiums and few decision guides for such collaborations. The session also introduced version control and discussed simple web based tools for Collaborative Research like Google Docs, Etherpads, Dropbox, Evernote, Skype etc. On the same day, Open Nepal also hosted a workshop about open data, and a session on Open Access Button was hosted by the organizers. Sessions in the previous day included sessions that enlightened the audience about Introduction to Open Access, Open Access Repositories, and growing Open Access initiatives all over the world. This event dedicated to Open Access in Nepal was well received in the Open Communities of Nepal which has mostly concerned themselves with Open Data, Open Knowledge, and Open Source Software. A new set of audience became aware of the philosophy of Open. This author believes the event was a success story. Despite the huge amounts of public money spent on allowing researchers to access the published results of taxpayer funded research , there is little fiscal transparency in the scholarly publishing market and frequent examples of secrecy, where companies or brokers insert non-disclosure clauses into contracts so the cost of subscriptions remains opaque. This prevents objective analysis of the market, prevents libraries negotiating effectively with publishers for fair prices and makes it hard to ascertain the economic consequences of open access policies. This matters. Open access campaigners are striving to make research results openly and freely available to everyone in a sustainable and cost effective manner. Without detailed data on current subscription costs for closed content and the emerging cost of article processing charges (APCs) , it is very difficult to accurately model and plan this transition. Specifically, there are concerns that in the intervening period, publishers may be benefiting from ‘double dipping’ – offering hybrid products which incur APCs for open access articles and subscription fees for all other content which could result in higher overall income. In a market where the profit margins of several major publishers run at 35-40% and they exert monopolistic control over a large proportion of our accumulated scientific and scholarly knowledge, there is understandably a lot of anger and concern about the state and future of the market. Over the past year, members of the Open Knowledge open science and open access working groups have joined many other advocates and concerned researchers, librarians and citizens in working tirelessly to gather information on the true cost of knowledge. Libraries do not routinely publish financial information at this level of granularity and may be constrained by contractual obligations, so the route chosen to obtain data in the UK has been Freedom of information act (FOI) requests. High profile mathematician and OA advocate Tim Gowers revealed that the cost at Elsevier journals at top universities. Two further rounds of FOI requests by librarian and OKFest attendee Stuart Lawson and Ben Meghreblian have given an even broader overview across five major publishers. This has been released as open data and efforts continue to enrich the dataset. Working group members in Finland and Hong Kong are working to obtain similar information for their countries and further inform open access advocacy and policy globally. Subscription data only forms part of the industry picture. 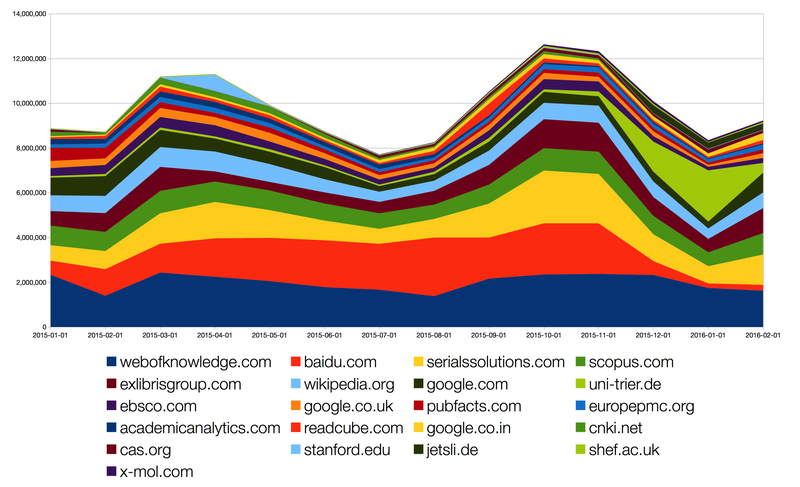 A data expedition at Oxford Open Science for Open Data Day 2014 tried to look into the business structure of academic publishers using Open Corporates and quickly encountered a high level of complexity so this area requires further work. In terms of APCs and costs to funders, the working groups contributed to a highly successful crowdsourcing effort led by Theo Andrew and Michelle Brook to validate and enrich the Wellcome Trust publication dataset for 2013-2014 with further information on journal type and cost, thus enabling a clearer view of the cost of hybrid journal publications for this particular funder and also illustrating compliance with open access policies. We’re hoping that this series can inspire even more work around Open Access in the year to come and that our community will use this week to get involved both locally and globally. 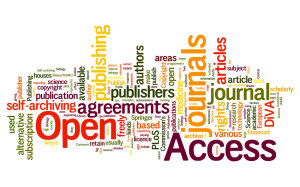 A good first step is to sign up at http://www.openaccessweek.org for access to a plethora of support resources, and to connect with the worldwide Open Access Week community. Another way to connect is to join the Open Access working group. Open Access Week is an invaluable chance to connect the global momentum toward open sharing with the advancement of policy changes on the local level. Universities, colleges, research institutes, funding agencies, libraries, and think tanks use Open Access Week as a platform to host faculty votes on campus open-access policies, to issue reports on the societal and economic benefits of Open Access, to commit new funds in support of open-access publication, and more. Let’s add to their brilliant work this week! Comments Off on Celebrating Open Access Week by highlighting community projects!